We are delighted that the 2014 China Games will be held in Shanghai at SRFC on Saturday 31st May. This is an extremely important event in the Shanghai GAA calendar and we hope that our members will come together to help make the tournament a tremendous success. Last year we came way from an unforgettable weekend in Beijing with both the mens and the ladies cups. Let’s make sure both are retained! Hosting teams from all around China it will certainly be a day of fun and games for all the family. So far, we are expecting mens and ladies teams from Suzhou, Beijing, Hong Kong, Seoul and Dalian. Teams will be arriving on the Friday and Monday 2nd June is a national holiday in China so it is likely that there will be 3 nights of celebrations! Pitch side entertainment includes a large kids play area, BBQ and full bar facilities. 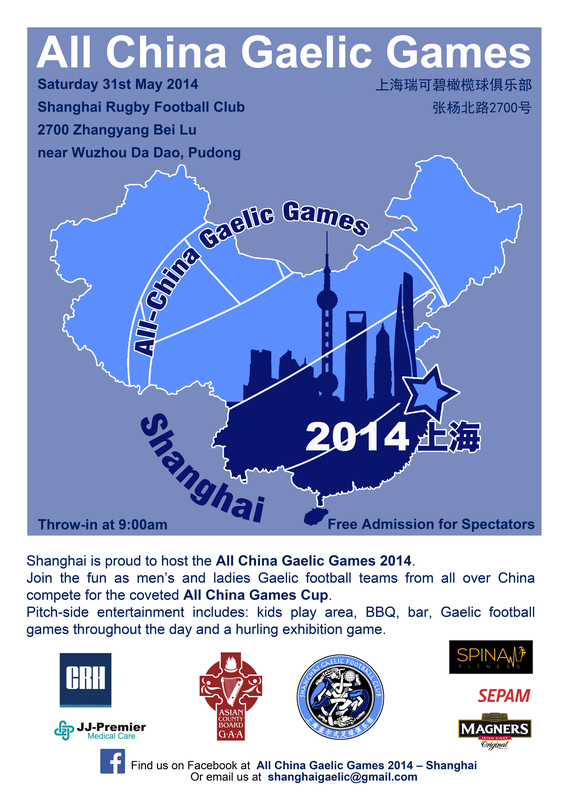 If you are interested in playing or coming along to watch, email shanghaigaelic@gmail.com.